Plastic Machining. – Milling.– Routing. – Turning.– Fabrication. Firstly, the make up of GPO3 Machining materials is a blend of fiberglass with a polyester resin. Therefore the result of this blend is a material that offers excellent ark and track resistance. The commonly known GPO3 is one of the most popular grades of GPO. This is a popular grade, specified by many Technical departments, mainly due to its high temperature insulation capabilities. 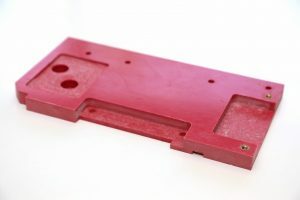 As a result of being the most economic choice of GPO material, it is also noteworthy for being a material which can be easily machined to bespoke applications. Some examples of what GPO3 Materials are widely used to manufacture are Insulating supports, high voltage insulation, bus bar supports and mounting panels in electrical apparatus are just some examples. Based on the needs of its particular application GPO comes in several grades. GPO1, Gpo2 & GPO3. Another important factor is GPO3 has a thermal index of 120°C electrical and 155°C mechanical. So there are many advantages to using GPO3 Machining Materials. Most of all having high structural strength but also excellent Electrically Insulating properties. Most noteworthy, raw GPO3 materials are available in standard sheets & rod sizes. But it is also available in a varying cataloged selection of channels & angles. Finally a couple of important factors. Firstly Sheet thickness ranges from 0.8mm to 50mm. Secondly Red and White are the standard colours.